From what I hear, training for a marathon can be pretty intense. You need to hit a certain amount of miles per week, keep up with your pacing, and keep healthy all before the big day. So, if you live in an area with unpredictable weather, treadmill running might be the way to train. You can keep training in any weather, your running does not have to depend on the weather outside. You can keep track of your miles more accurately. 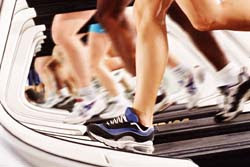 Running on a treadmill can give you a false sense of speed. You may keep a different pace on a treadmill than what you would keep outside. Do you prefer running on a treadmill or running outside? Personally, I love scenery. I also love feeling like I'm going somewhere and actually covering ground. What about you?